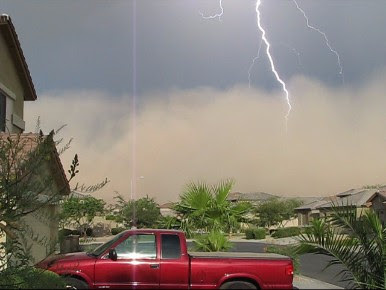 Dust storms are common occurrences during the summer months in the Arizona low deserts. The intense heat and nearby mountains give rise to thunderstorm development within the mountain regions. Often these storms meander out of the mountains and into the low desert around Phoenix, Gila Bend, and Casa Grande. However, there are often numerous factors that make these thunderstorms unlikely to sustain themselves. These desert storms are powered by the uplift created by the intense heat and mountains (some of which reach 7000-9000 feet elevation). Unlike in the eastern half of the US, there are rarely weather disturbances (such as cold fronts) to provide energy to sustain storm development. Usually if either the heat or the mountains are taken out of the equation, these desert storms collapse. This is especially true since deep atmospheric moisture is not very common. Late June through the end of September is the peak of the Arizona thunderstorm season. This coincides with weather patterns that bring in moisture, often from as far away as the Gulf of Mexico, or on occasion the Gulf of California. Dew points can reach 55 or even 65 degrees on rare occasions, providing more than enough moisture to fire up the storms over the mountains. Those rare 65 degree dew point days often provide enough 'fuel' to fire storms over the low desert as well, even after the sun has set and temperatures start to cool. Dust storms occur when a storm collapses. The uplift inside a thunderstorm can push air as high as 50000 feet. When the ingredients for the storms dissipate, all of this air rushes towards the ground and fans out. This spectacular collapse of thunderstorms, while not unique to Arizona, occurs much more frequently in the desert southwest than other parts of the US. This collapse kicks up winds of 40+ mph, sometimes as high as 60 mph. Tree branches are often broken, some trees uprooted, and on rare occasions, light poles, roofs, and other structures are damaged. With those intense winds along the storms outflow boundaries, dust is kicked up creating 30-50 mile wide dust storms, with "walls" of dust reaching up to a couple thousand feet into the air. The video linked below was taken July 18. The dust storm itself was not a very strong one, but the direction of approach and timing made it convenient to take a video. Below is a frame capture from the lightning in the video above. One other interesting factor is that these outflow boundaries can on occasion collide (i.e. if two thunderstorms on opposite sides of the valley collapse). If there is sufficient moisture, sometimes this collision can create the necessary uplift to spawn a thunderstorm. These sorts of interactions make predictions of storms very difficult. This time of year it is pretty much a daily 30-40% chance in the mountains, and 10% or so chance in the low desert.